Savrasov was born in Moscow and studied at the Moscow School of Painting, Sculpture and Architecture (MSPSA) under professor Karl Rabus (1800-1857). In 1852, Sarasov traveled to the Ukraine. Then, in 1854, the Grand Duchess Maria Nikolayevna, President of the Imperial Academy of Arts, commissioned several works from him. Savrasov therefore moved to Oranienbaum, near Saint Petersburg. “View in the Neighbourhood of Oranienbaum,” 1754, earned Savrasov his membership in the Russian Academy of Arts. In 1854, Savrasov’s View in the Neighbourhood of Oranienbaum (1854), earned him membership in the Imperial Academy of Arts. By the invitation of the Grand Duchess Maria Nikolayevna, President of the Imperial Academy of Arts, he moved to the neighbourhood of St. Petersburg. In 1857, the year Savrasov married Sophia Karlevna Hertz, the sister of art historian Karl Hertz (1820-1883), he became a teacher at the Moscow School of Painting, Sculpture and Architecture (MSPSA). His best students were Isaac Levitan and Konstantin Korovin, who had fond memories of him. In Moscow, he and his wife entertained art lovers and art collectors, including Pavel Tretyakov, who gave his art gallery to Russia in 1892. At this time in his life, Savrasov had a fine and productive relationship with artist Vasily Perov. Savrasov helped Perov paint his Bird catcher and Hunters on Bivouac and Perov helped Savrasov paint the boat trackers in his Volga. 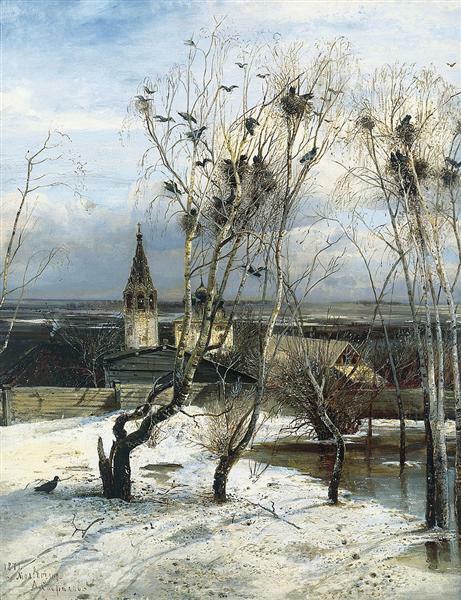 Savrasov’s “The Rooks have returned” (1871) is considered one of his finest, if not his finest, painting. But so many of Savrasov’s paintings are masterpieces that saying one is the best is a genuine challenge. 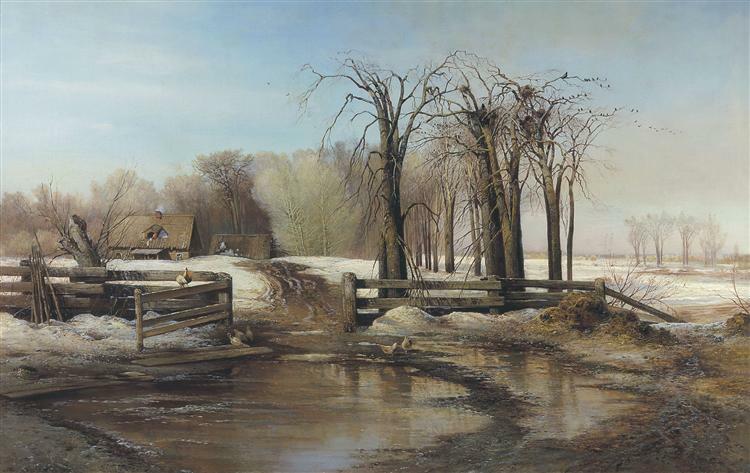 For instance, “A Spring Day” (1873) is perfection and it touches us because it depicts the beginning of a season. Human beings have painted the seasons for a very long time and they have kept Books of Hours. Jean de France, duc de Berry‘s Très Riches Heures depicts each month of the year and its labour. Savrasov’ paintings often portray transitions and, therefore, renewal They show the end or beginning of a season, the end of winter, in particular. Seasons follow seasons eternally. Life rises again, irrepressibly. Note that smoke comes out of the chimney of the first little brown homes. Until now, the Industrial Revolution, humans have protected themselves. We have dealt with the elements, found a refuge and built roads and fences. The pale green of trees in the background allows us to get a clear view of the disheveled trees burgeoning. The sky sits above a long arched line supported by small trees on the right and the bulkier houses on the left. “A Spring Thaw,” the painting placed at the beginning of this post, combines diagonal and other lines. They are hints of Japonisme. Moreover, the colouring is very smooth. Savrasov’s softens his landscapes as though each were a praise of nature and a prayer. Savrasov is certainly a poet but how sad about his alcoholism later in life. And, of course, I loved the video with the basso profondo. Savrasov is a marvellous poet. He graces nature with all its beautiful. Everything is pure. The death of his daughter led him to alcohol. Some populations are more prone to alcoholism than others and it is difficult to find medical help. It can now be threated but nevertheless destroy many individuals. As for the basso profondo, it is a voice that truly enriches both choral music and the humble song, ones with refrains. Most populations do not produce the basso profondo but Russia and certain Slavic countries do. There are better videos displaying Savrasov’s paintings, but the accompaniment is not Russian music and could be. Rachmaninoff’s Vespers and the music of Rimsky-Korsakov are the tip of the iceberg. The spirituality of the Orthodox Church astonishes me. Love Amanda. You are dear to me. And thank you for enriching my life. Amanda, The feeling is mutual. You enrich my life. Destiny is at times very kind. 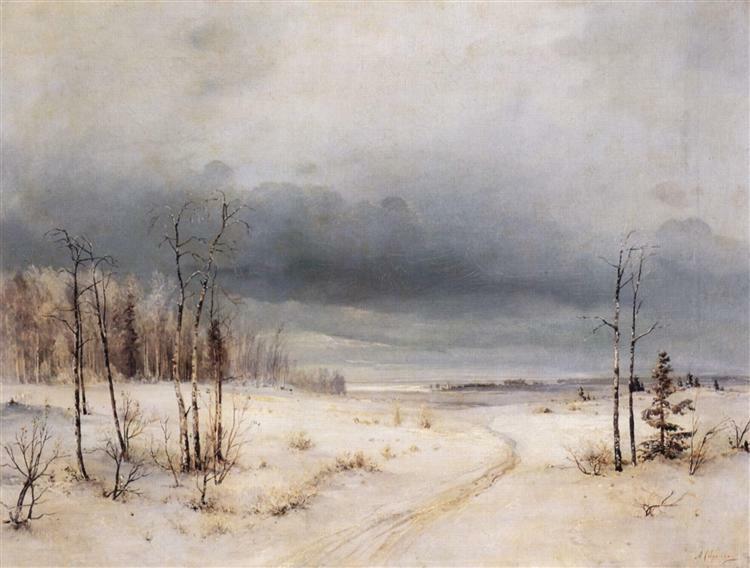 I’ve always felt that Savrasov’s paintings were somewhat depressive, but then so is the Russian winter (to me, that is). Thank you for Prokofiev, dear Micheline! Thank you. Savrasov is a poet. I had difficulty finding a video with Russian music. Fortunately, I found Prokofiev. Savrasov is a melancholy poet; at least that’s my feeling.